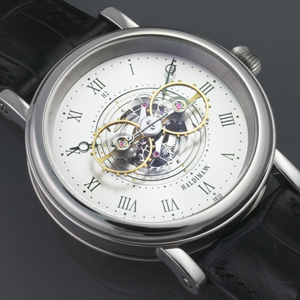 With H2 Resonance, creative watchmaker Beat Haldimann has entirely rethought the watch as an objet d’art first, and a measuring instrument second. The heart of this masterpiece lies in the central flying tourbillon with its three barrels characterising the expertise of this brilliant watchmaker, and entirely developed and hand-assembled in his Thun workshops. The dial speaks for itself: to the delight of passionate enthusiasts, technical mastery meets aesthetic virtuosity inside a beautiful resonance carriage featuring two balances and two constant-force escapements. 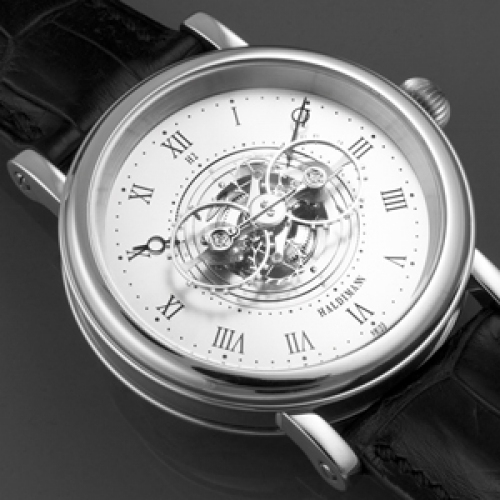 The platinum case is hand-crafted in harmony with the family tradition cultivated since 1642.